Chili’s Chicken Crispers copycat with the delicious shatteringly crispy crust that Chili’s crispers famously have, but made at home! So easy to make and also a great batter for fish too! Back to Chili’s today for one of my kids’ favorite chicken tenders of all time. 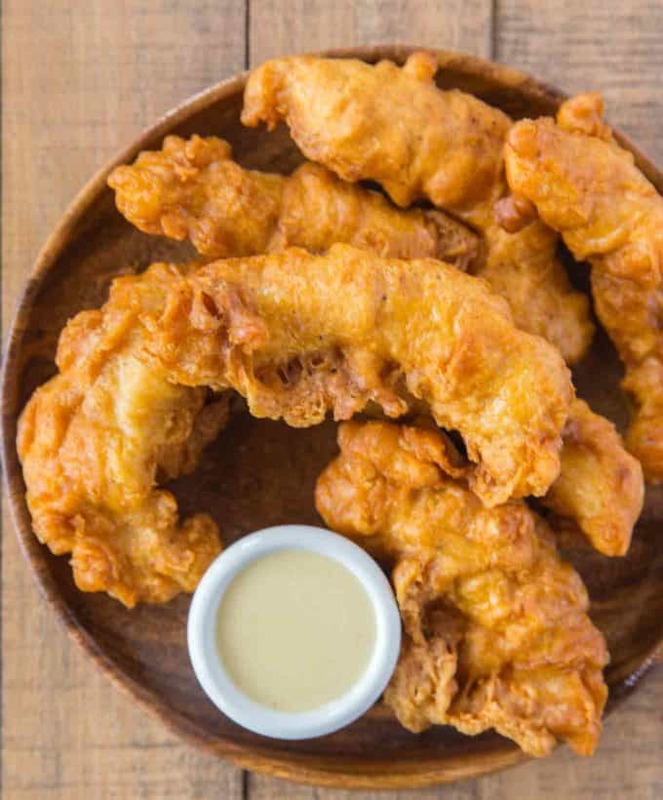 The original Chicken Crispers with that sort of fish and chips texture that’s super different from most chicken tender recipes. 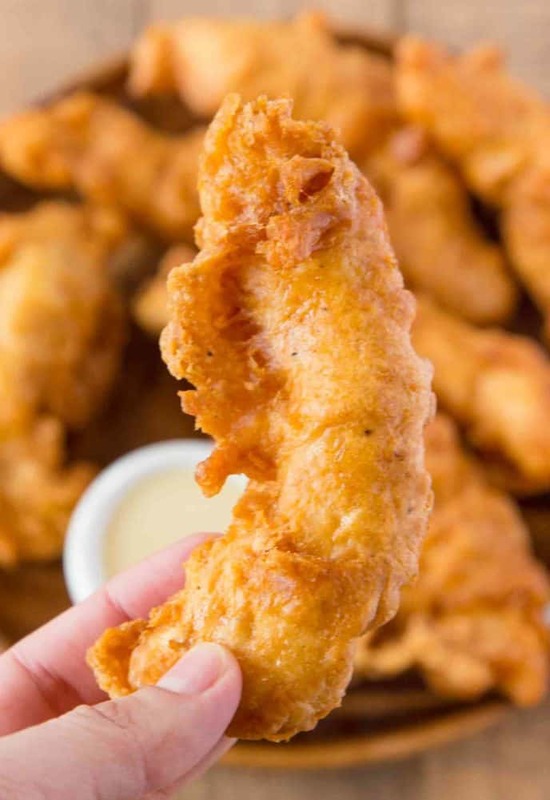 Most chicken tenders have a crispier, more texture, but these are more of a cross between a tempura texture and a fish and chips texture, smoother, lighter batter and the edges, with the super crispy just batter that fried up is so light in texture you’ll find yourself sneaking pieces of it while cooking. Yes, the original recipe does call for MSG, but the copycat recipe swaps out the Accent Seasoning for chicken broth, per Todd Wilbur. In this swap it works well to emulate the same flavors. 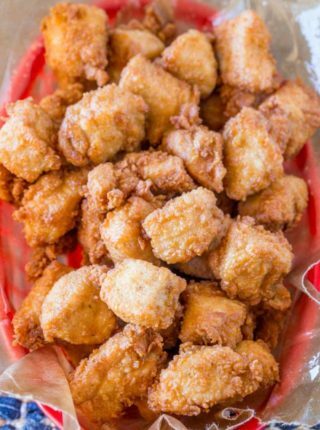 What to serve with Chili’s Chicken Crispers? 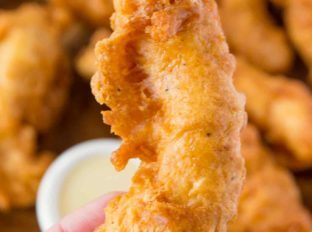 Classic chicken tenders are best served with KFC Potato Wedges, KFC Coleslaw, Crispy Sweet Potato Fries or even your favorite potato salads. Let’s discuss the dipping sauces! There’s two that are our absolute favorites at Chili’s and they’re both so EASY to make. Add the ingredients to a small saucepan and bring to a boil. Cook, whisking, for two minutes before turning off the heat. 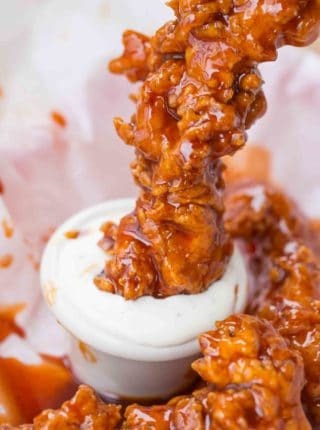 Cool the sauce before serving as a dip or toss the chicken crisper in the warm sauce if serving fully dipped. Chill in the refrigerator for at least a couple of hours before serving. Deep Fryer: Easy for keeping temperature on point and kind of fun to use! Chicken Base: I almost never buy boxes of broth because I keep the beef, chicken and vegetable version of this Better Than Bouillon. Pigtail Flipper: I LOVE this tool for frying. I am able to drop and pick up pieces without removing any breading at all thanks to this awesome tool. Chili's Chicken Crispers with the delicious shatteringly crispy crust that Chili's crispers famously have, but made at home! So easy to make and also a great batter for fish and chips! Heat oil in a dutch oven to 350 degrees. In a large bowl whisk together the egg, milk, chicken broth, salt and pepper until well combined. Add in the self rising flour. In a second bowl add 1 cup of flour. Dip each piece of chicken into the batter, then into the flour. Add the chicken to the oil in small batches and fry for 8-10 minutes, or until golden brown and cooked through. YES! I’ve been looking for a recipe that’s just like Chili’s for my son’s chicken finger obsession. This one is great! Is there any way to copy your recipe for Chili’s copycat chicken crispers? I hit print but then a copy comes up with nowhere to print. I’m using google chrome. The print button on the recipe card is working for me, not sure if it was a glitch when you tried. You can also go the the top left of your screen and under file is a print option. I just checked and both are working. Hope this helps! I can’t wait to make this recipe tomorrow night for dinner ?. This looks and sounds sooo good ?. I will make sure to hashtag my photos on my Instagram account ??. Thank you for sharing ? So if I own MSG does that replace the chicken broth all together or how would that work? Looks amazing, thanks! I’ve never cooked with MSG so I haven’t been able to test it but I would err on the side of caution and start with 1/2 teaspoon and adjust from there. Hope this helps! I have made these a couple of times and they are really good! 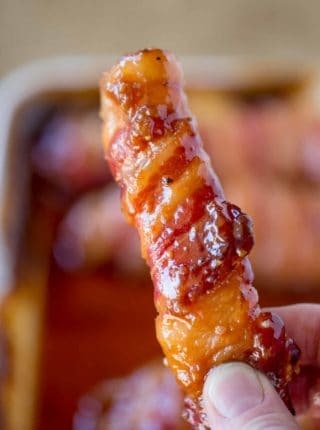 Can I make this in an air fryer instead of deep frying? Would you modify the recipe or simply put in the air fryer instead of deep fryer? I’ve never tried it so I can’t say. If you decide to try, I’d love to know how it turns out. Thanks! Thanks for posting this recipe, it was a big hit last night, even for our picky teen-ager. We will be making this again! You’re welcome, Kelly! Thanks for the 5 stars! How may I substitute AP flour for self rising? I don’t ever buy that ingredient. Add 1 1/2 teaspoons baking powder and 1/4 teaspoon salt to 1 cup of AP flour as a substitute for self rising flour. We really enjoyed our chicken strips, they were delicious. We will be using this recipe over and over again! I don’t have any whole milk so can i use buttermilk instead? It will change the flavor a bit with buttermilk having some acidity to it but will still work in a pinch. Sorry, didn’t mean to confuse you. 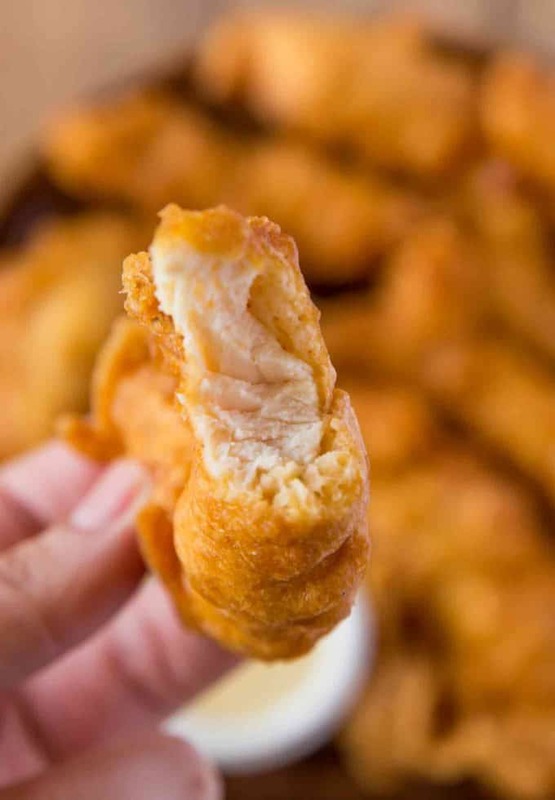 You’ll want to dip the chicken into the batter first then into the flour before placing into the oil to fry. Hey you have mentioned self raising flour in the batter and the other being just flour to coat….which is this plain flour( whole wheat or Cornflour)? These look really good! I can’t wait to give this a try! These look really tasty! I can’t wait to give this a try! Looks delicious. One question. In direction number five, do you mean to dip the chicken into the flour first and then the batter? I know it sounds backwards but dipping in this order creates that wonderful crispy batter. I hope you enjoy it! Oh boy… these look DELICIOUS!!! I just LOVE copycat recipes! Me too! Saves me from having to go out! Everyone needs a Chili’s Chicken Crispers recipe like this! OMG! 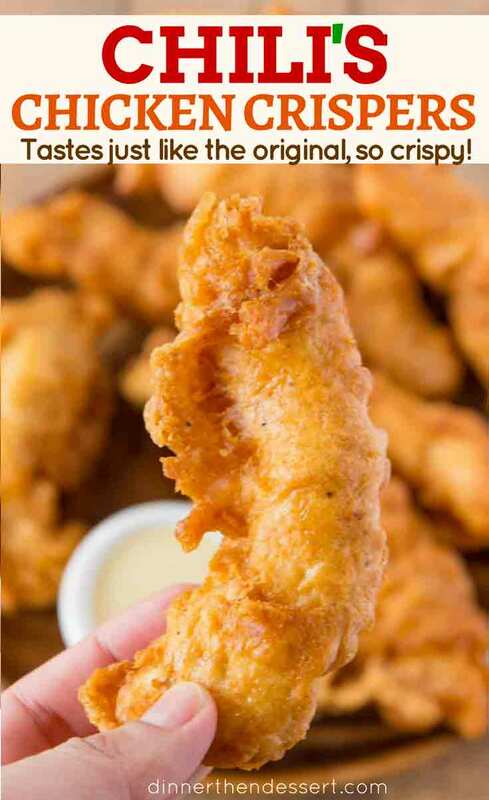 I used to love Chili’s chicken tenders, but sadly seven years ago we moved far away from any locations and I haven’t had them since ?. I’m definitely going to try your recipe out and see if it satisfies the odd craving I get whenever I see a commercial for Chili’s. Thank you! Love these from Chili’s. I know I am going to love these even more. I love ordering these! I love the light and airy batter! Excited to make them at home! The crisp on those looks absolutely perfect! What kind of recipe specification is that, with all those question marks? Thank you so much for catching that! Sometimes when the recipe card gets pulled it, it’s glitchy. I just corrected it. How deep should the oil be in the Dutch oven? I would recommend about 3 inches of oil. I hope you enjoy them! What if I don’t have a Dutch.. oven? You’ll just want to make sure you have something with high enough sides that you can fry them without in splattering everywhere.